Britain's former chancellors - Lamont, Darling and Lawson who each played their parts in fuelling past UK housing market bubbles are now busy dribbling advice out of the corner of their mouths to George Osbourne as if we need their utterances to realise the fact that the ONLY solution ANY government has to attempt to get reelected is by INFLATING housing bubbles! So of course George Osbourne is inflating a housing bubble that ultimately he too will screw up just as the three former financial clowns had before him. Instead George Osbourne's response has been to play pass the buck back to the Bank of England. George Osborne has indicated he will not act to cool the housing market and instead lay responsibility at the door of the Bank of England. The Chancellor said the central bank "should not hesitate" to use its powers to tackle any house price bubble but suggested he would not directly intervene despite growing concerns about the possibility of strong rises in values leading to a crash. The Paris based OECD which consistently shows that it cannot forecast its way out of a paper bag by usually calling trends several years AFTER the fact, thus today's housing bull market is a bubble ready to burst, which translates into many years from now when the market does eventually PEAK the OECD will likely be stating that it was in a sustainable trend. The Government and Bank of England must act to curb mortgage lending or the recent surge in demand could see house prices spiral out of control, the Organisation for Economic Co-operation and Development has warned. Britain's booming housing market could be heading for a fresh crash, the Bank of England said in its toughest warning yet about the dangers of the return of rapidly rising property prices. Sir Jon Cunliffe, Threadneedle Street's deputy governor for financial stability, said it would be dangerous to ignore the momentum apparent across the country and dropped strong hints of new measures to slow down the market in the months ahead. The same flip flopping Jon Cuncliffe who several months earlier was stating that there was NO housing bubble! "It doesn't look that we are in a bubble." Sir Jon Cuncliffe telling members of parliament's Treasury Committee (Oct 2013). The mainstream press rambles on with literal warnings that Bank of England may go nuclear against home owners! The response to a UK real estate boom-bust is being toughened up as more evidence emerges of history repeating itself. The truth about the Bank of England's warnings are one of pure smoke and mirrors for the BoE has ENGINEERED the current housing bull market via a successive series of EXTREME measures from ZERO INTEREST RATES into their 6th year, to QE4EVER debt monetization that continues to funnel cash onto the balance sheet of the still mostly bankrupt banks, to the Money for Lending scam that PAYS the banks NOT to borrow money from depositors and thus the scandal of sub inflation savings interest rates stealth theft of purchasing power continues. 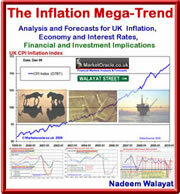 Thus the Bank of England's primary remit it is NOT to control inflation but instead to INFLATE house prices! 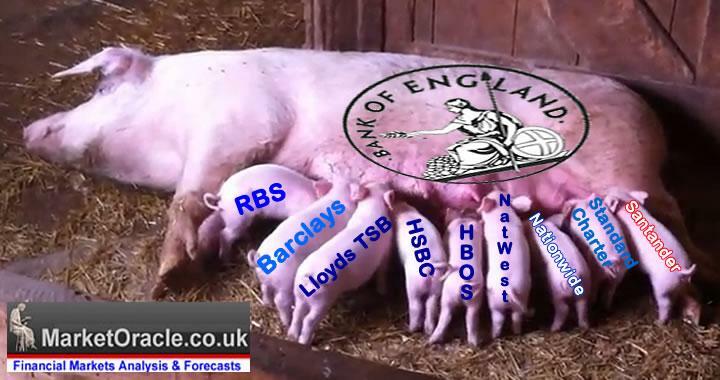 The Bank of England actions speak volumes over propaganda as the BoE continues to funnel cold hard cash (tax payer funded profits) to its bankster brethren whom it ultimately serves and is staffed by. What the banks desire for further artificial profits is a housing bull market that inflates the value of the property assets on their balance sheets that as a consequence of fractional reserve banking and the £1 Quadrillion+ derivatives market that they are leveraged to i.e. a relatively small percentage change in house prices results in a huge swings in profits which is why a few percentages drop in house prices in 2008 was enough to start bankrupting virtually EVERY UK BANK that ultimately resulted in tax payer bailout liabilities that SPREAD the price paid for the bailout out over the subsistent 6 years, as year on year average wage slave earnings failed to keep up with the Bank of England debt monetization inflation consequences. And don't forget that a general election is just 12 months away so instead of putting the housing market into reverse gear the Government will instead be putting the pedal to the metal and ACCELERATE UK house prices inflation. So watch for the Bank of England to come under even more pressure to NOT take any action that will stop the head lines of average house prices rising by more than £2000 per MONTH. Today, some 4-5 months on the latest opinion polls show that Labours poll lead has plunged to now being only 1 point ahead at 32% to the Conservatives on 31% (ICM 4th May 2014), which would translate into a hung parliament which is precisely inline with the forecast trend trajectory as I don't expect the Conservatives to start nudging into the outright election victory zone until around September by which time the UK economy will be entering the election economic boom phase of growing at the rate of more than 1% per quarter. The bottom line is that we are going to hear such bubble talk for the duration of this UK housing bull market that looks set to last for the remainder of this decade! Just as the now over 5 year stocks bull market has been followed by highly vocal ramblings of an always imminent crash or bear market for its duration. In my innocence, I always thought the Chairman of the BoE was independent of political machinations? Being an ex GS 'player' I would not be at all surprised if his every move is co-ordinated between the Treasury, The City and Wall St. I don't think you can place all the blame on the Bank of England. Osborne's little wheeze "Help to Buy (Votes)" has had a great deal to do with it as well. Deliberately re-inflating a housing bubble, underwritten by taxpayers, in order to bring in £billions in tax revenue and generate a bit of a feel-good factor on the run up to the General Election is cynical politics at its worst. The Government's debt is being transferred onto the shoulders of people who are struggling to buy their first home and are once again being encouraged to over-borrow. But this time, instead of hiding the fact that taxpayers will be picking up the bill, Osborne's made it perfectly clear who will be paying. This Housing Bubble is ruining lives, it has priced out my generation and if continues will price out future generations. Something must be wrong when people with good jobs and big deposits are priced out. Meanwhile the % of interest these saved housing deposits get is pitiful and well below inflation to bail out all those reckless borrowers who have borrowed too much. 5 years this inequality has continued with savers being robbed. Raise interest rates now and stop these 35 year mortgages which are the new serf cert / liar loan mortgage scam. The UK housing market is, like so many areas of the economies in so many other countries, the direct result of the bubble economics of the politicians and central bankers. Now I have no idea how long this will continue, but any economic trend that requires exponential inflation to maintain it is just a catastrophe waiting to happen. The longer it runs up the worse the crash will be when it finally happens. I wonder if we have entered the "crack up boom" Von Mises wrote about?